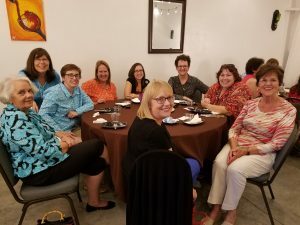 More than 50 women who attended the GIFT gathering Aug. 30 at Cauble Creek Vineyard got to meet a very special guest— Katie Luther. 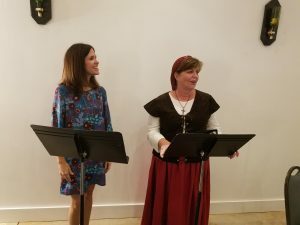 Katie was portrayed by Leigh Pittman of Greensboro, who has performed at other area churches and events celebrating women of the Reformation. Bif and Anita Yost, owners of the vineyard and new members of St. John’s, hosted the occasion in their event center. The vineyard was established in 2006 as North Carolina’s 100th vineyard. Marsha Tucker brought a contingent of women from Wittenburg Lutheran, her home church, including her mom, Phyllis Tucker. Watch the bulletins and faith+life emails for upcoming GIFT events.